We were a small group with only Silvio, Dean and myself in attendance. I started the night by sharing my neutrino knowledge that I acquired from a recent COD talk. Neutrinos were first proposed in the 1930s but not detected until the 1960s. About 65 billion neutrinos pass through each area of your body the size of a fingernail each second. They come mostly from the sun but also from radioactive decay. There are three flavors: 1) electron; 2) muon and 3) tau. Neutrinos sort of shape-shift as they travel through space changing from one flavor to another. Scientists think they might actually be a probability composite of all 3 flavors in one particle!(?) They are extremely tiny and can travel through a light-year of lead without any interactions. Being without charge they interact only through the weak nuclear force. If an electron weighs 500,000 ev, a neutrino weighs <2-3 ev. Fermilab in Batavia will be experimenting with them by shooting them through 800 miles of Earth to a deep underground mine in South Dakota where a large vat of liquid argon will detect them. Astronomy Day at Harper College is coming next Saturday, April 21, 5:30 to 9 PM. Speakers include Dean and Kevin Cole, CSSS people such as Jim Plaxco and Jim Kovac and others from Harper College and the Northwest Suburban Astronomy Club. Of course we had to put SpaceX at the forefront again. They have released a new video of the Falcon Heavy mission which shows the core booster crashing just off the side of their landing barge. I never get tired of seeing StarMan riding in his Tesla with the Earth in the background. We also talked about SpaceX pushing their Commercial Crew dates back to August 2018 for the uncrewed mission and December 2018 for their first crewed Dragon mission to ISS. 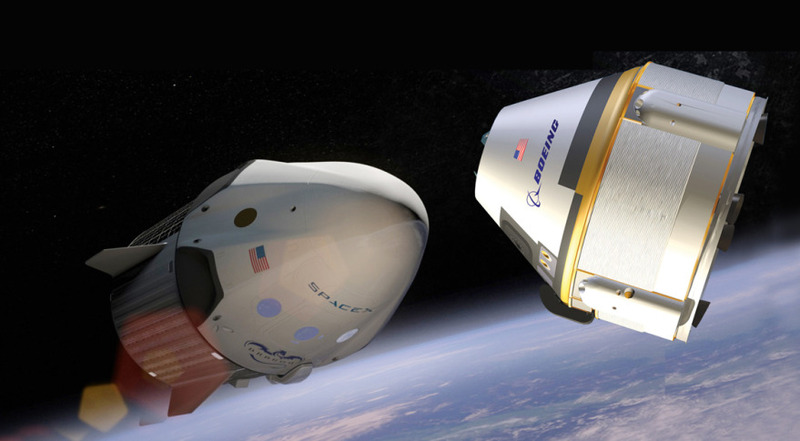 Boeing is now one month ahead of them with their crewed mission set for November 2018. NASA is starting to worry because their last contracted Soyuz capsule launches in the Spring of 2019 and they have to have Commercial Crew going or we won’t be able to get US astronauts to our $100 billion ISS. Phil’s guess on the MASSPrize has come and gone and Harry seems to have the best chance at winning the contest now. NASA is even investigating putting a third astronaut on Boeing’s first test flight and expanding the mission from 2 weeks to 6 months just like a regular crew rotation mission. NASA has told SpaceX that they must fly their new Block5 version of the Falcon9 seven times before putting people on it. The first Block5 is set to launch the Bangabandhu satellite for Bangladesh on May 4. The Block5 has been optimized for reliability and reusability. They have re-engineered their engine turbopumps so that they do not experience cracking on their blades and their helium tanks are stronger after a couple of failures. SpaceX feels that the Block5 will be able to be used 10 times before refurbishment is needed. And get as many as 100 total uses per booster. That is why SpaceX has not tried to recover their older first stages after the last five launches. On Commerical Crew, NASA is working toward a 1 in 270 Loss of Crew probability and a 1 in 55 Loss of Mission. As high a loss probability this might seem, it is 10 times better than the Space Shuttle during its final days. SpaceX’s next launch will be NASA’s TESS (Transiting Exoplanet Survey Satellite) this coming Monday, April 16. TESS will follow the tremendous Kepler mission which found 2600 exoplanets and 4500 additional strong candidates. TESS will survey almost the entire sky over its 2 year initial mission. It will look at 2 million of the closest and brightess stars. It hopes to find 5000 signals that will include about 300-500 earth or super-earth exoplanets. The top 50 finds will be turned over to the James Webb Space Telescope to see if it can detect what their atmospheres are composed of. Because TESS will only look at most sections of the sky for 27 days, the exoplanets will have to be in extremely tight orbits of 13 days or less. Since the habitable zone around red dwarf stars is very close to the star and since red dwarfs are 75% of the stars near the sun, there should be plenty of finds. The fact that the stars will be 10 times closer on average (300-500 light years) than the stars that Kepler looked at, will make them 100 times brighter and much easier to study in detail with larger earth or space based telescopes. Another launch coming up on May 5 will be NASA’s Insight mission to Mars. This will be the first time a Mars mission has launched from Vandenberg in California. The reason is that this site has less conflicts with other missions and the Atlas V has plenty of power to pull it off. Insight is based on the successful Phoenix lander and will attempt to study the inside of Mars. They hope to burrow a heat sensor up to 16 feet down and deploy an extremely sensitive Mars-quake device. The mission hopes to study Mars for 2 years from its Elysium Planitia location. A new proposal from Northrop Grumman for long duration flying Venus probe called VAMP (Venus Atmospheric Maneuverable Platform) has Dean excited about a return to that planet. Amazingly 50 km up in the clouds around Venus the temperature is only 86 to 158 degrees F and the pressure is similar to Earth’s surface. Bacterial life could potentially survive there. I’m sure NG is trying to parley their pilotless drone technology into space missions. SpaceShip2 starts powered flights – VSS Unity had its first powered test since the 2014 accident that killed one pilot and destroyed the VSS Enterprise. It was dropped from 46,500 ft and fired its motor to reach 84,270 ft. The Von Karman line for space is 100km or 62 mi or 330,000 ft. With the new heavier craft, Virgin Galactic will only reach a height of 80 km. Still quite a ride for your $250,000 but Blue Origin might get the lion’s share of space enthusiasts because they will get above the 100 km line in their sub-orbital New Shepard rocket and capsule. Lunar X Prize will keep on going – The X Prize organization said they will re-launch their contest but are looking for a new sponsor now that Google has dropped out. SpaceIL of Israel says they will continue on with their 3 month travel to Mare Serenitatis mission. They would be the fourth country to land on the moon. Astrobotic, a Pittsburgh based company, still plans to launch its Peregrine lander on an Atlas V in mid-2020. Peregrine will put 584# of scientific packages on moon. Moon Express plans to send it MX-1E on an Electron rocket. Their goal is to start mining the moon. They haven’t shown any hardware yet. TeamIndus of India is looking at 2 launch providers to send their probe in 2019. The status of the piggy-back Hakuto from Japan is unknown. The “Everyday Astronaut” tells you everything you need to know about the Electron rocket and how it compares to SpaceX. This is a cool guy who bought a Russian space suit on the Internet and now does all his broadcasts wearing it. Its amazing that Rocket Lab can 3-D print one of their Rutherford engines in just 24 hours. They will cater to the cubesat market but won’t undercut SpaceX in the cost per pound to orbit. Their first paying launch is scheduled for April 19. China is planning the Chang’e-4 rover landing on the moon. They are planning to land it on the far-side of the Moon in the resource rich South Pole Aitken basin. They will need a relay satellite in orbit around the moon which is scheduled to launch in May or June of 2018. Their Chang’e-3 rover landed in late 2013. I really wonder if we should bring China into our International cooperation of returning to the Moon. My concern is their predilection to steal intellectual property. Chad feels we could pull it off and Dean says there is nothing like an autocratic country like China to “stay the course” and accomplish the goal. Here is Trump and Pence telling us how the US is going back to the Moon. I like this approach of going back to the Moon, but putting all the military references to it gives me the creeps. I thought Obama really missed the mark when he said our Moon exploration was “been there, done that”. I think we need the moon to shake down our space infrastructure and I think we can bring our commercial partners along with us this time to the moon. Let’s see if we can lower the cost of space exploration by starting to utilize resources of the moon and the asteroids. They say a 2 km NEA asteroid like Amun has 30 times the metal than all the resources ever mined on the Earth. The Trump Administration completely gutted the education line item of NASA and canceled the WFIRST space telescope which would be the follow on to the James Webb Space Telescope. Fortunately the Congress had other ideas and re-instated both items in their proposed budget of $20.7 billion. NASA plans to stop funding the ISS in 2025. We’ve got to transition this fabulous asset to the commercial sector to keep its phenonenal science development going. Hopefully we’ll find a way to make this happen. The New Horizons next encounter object received a temporary name from NASA, Ultima Thule (pronounced thoo-lee). It took 34,000 submissions to name 2014 MU69. The name means “beyond the borders of the known world”. After it is determined if it is a single object, a binary pair or a multi-object system, a formal name will be submitted to the IAU. It’s official we can start planning for our Ultima thule-alooza party that will best our Pluto-palooza gala. Vanguard 1 still in orbit 60 years later – Vanguard 1 was the fourth satellite after Sputnik 1 and 2 and Explorer 1. Its initial orbit was 2466 mi by 406 mi and was expected to orbit for 2000 years but the high solar events caused more drag and it is expected to burn up after only 240 years. Dubbed the “grapefruit” by the Soviets, it launched on March 17, 1958. At just 6.4 in in diameter and weighing 3.2 lbs, it was a tiny satellite. I vividly remember the Vanguard rockets lifting 3 feet only to explode and the poor Vanguard satellite would topple off the rocket into the burning inferno. Of the 11 Vanguard rockets only 3 were successful. Their capability was only 20 lbs into orbit. Out of frustation with the Vanguard failures, Eisenhower switched to Werner Von Braun and his Jupiter-C army rocket to get Explorer-1 into orbit. Steven Hawking dies at 76 on March 14 – He died at his home in Cambridge, UK. He suffered from ALS since his early 20’s. In 1974 he argued that black holes radiate energy when particle-anti-particle pairs pop into existence on the event horizon of the black hole causing Hawking Radiation and the eventual evaporation of the black hole. The radiation has never been observed because it is extremely low temperature. That is why he never received a Nobel Prize for his idea. On his 75th birthday he urged people to “look up to the stars and not down at your feet”. He became a celebrity with his book “A Brief History of Time and was twice married and divorced. He is survived by two sons and a daughter from his first wife. James Webb Space Telescope (JWST) slips another year – New launch date is now May 2020 at the earliest. Thrusters were damaged during cleaning and the sun shade was torn during testing. Concern is that it will now exceed the Congressional cap of $8 billion. Already $7.3 billion has been spent. Who are we kidding, it is too big to fail. It is now delayed 13 years past its first goal date. Twenty years since the discovery of Dark Energy in 1998 – Most recent Sky &Telescope magazine had a great article about it. If the volume of space expands by a factor of 4, mass density is reduced to ¼ the previous value but dark energy will stay the same concentration. That is why it is overcoming the attractive force of gravity and causing the universe to expand all the more rapidly. It is like anti-gravity. Last year was 100 years of Einstein’s General Relativity (1916) where he used the cosmological constant, lambda, to keep the universe from collapsing due to gravity. Einstein’s goal was a static universe. When Edwin Hubble discovered the expansion of the universe in the late 1920’s, Einstein called the constant his “greatest blunder”. Now with Dark Energy we’ve put lambda back into the equations to signify its repulsion effect on the expansion of the universe.